The Celtics visit the Pacers on Friday with the teams tied for fourth place in the East with three to play. One team opened as a small favorite, but the line flipped within a few hours. The Celtics visit the Pacers on Friday with the teams tied for fourth place in the East with three to play. 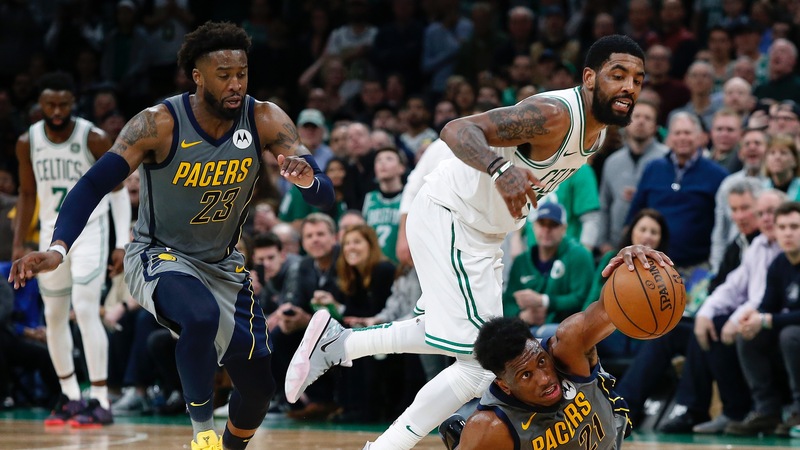 Boston opened as a 1.5-point road favorite Thursday afternoon at the Westgate SuperBook, but the Pacers were -1.5 [a mere 2.5 hours later](http://www.vegasinsider.com/nba/odds/las-vegas/line-movement/celtics-@-pacers.cfm/date/4-05-19/time/2005#J). The SuperBook moved the line to a pick 'em Friday morning, with William Hill dealing Indiana -1.5 and other books at -1. The teams are [both 47-32](https://www.thescore.com/nba/standings), with Boston owning the head-to-head tiebreaker. (The second tiebreaker is conference record, and the Celtics enter 33-16 against the East, while Indiana is 32-17.) Friday's game is set to tip at 7 p.m. CT on ESPN. The total is 215, and the Pacers are -115 on the moneyline at William Hill, while Boston is -105. The Celtics (36-41-2 against the spread, 19-20 road, 16-21-2 ATS road) appear to be getting hot at the right time, having won four of five following a four-game skid. But Boston is only 2-3 ATS in its recent run, making the Celts 7-13-1 against the number since the All-Star break, though they are 4-3 ATS in that span as underdogs. Boston is also 26-22-1 ATS against Eastern Conference teams, as opposed to 10-19-1 against those from the tougher West. The Pacers (39-39-1, 29-10 home, 23-16 ATS home) are a different team when they play in Indiana, going 11-3 SU at home (10-4 ATS) since the beginning of February, including wins over the Nuggets and Thunder. They had lost 10 straight on the road before a home-and-home sweep of the Pistons (SU and ATS) earlier this week. Without point guard Darren Collison or swingman Wesley Matthews in either game against Detroit, the Pacers leaned on bench contributions from players like former Bulls fan favorite [Dougie McBuckets](https://www.basketball-reference.com/players/m/mcderdo01.html), who had 25 points in the two games on 11-of-15 shooting (73 percent). __MORE:__ [Pacers need to win two of last three to go OVER season win total](https://www.betchicago.com/nba-win-total-update-over-under) <a href="https://www.youtube.com/watch?v=xE-qr1KZ6D0" class="embedly-card" data-card-width="100%" data-card-controls="0">Embedded content: https://www.youtube.com/watch?v=xE-qr1KZ6D0</a> Collison (groin) and Matthews (hamstring) are game-time decisions for Friday. This will be the last of four regular-season meetings between the teams. Indana earned a 102-101 home win Nov. 3 as a 3.5-point underdog, but the Celtics won the next two, 135-108 on Jan. 9 and 114-112 last Friday, both times as 7-point favorites. The OVER hit in both games in Boston, but UNDER cashed in Indiana. With that, let's get to the rest of the busy 13-game Friday NBA card, which also includes the Blazers visiting the Nuggets. __MORE:__ [Odds Zion Williamson ends up with Bulls](https://www.betchicago.com/nba-draft-2019-odds-lottery-bulls-zion-williamson) ## Friday NBA betting lines, odds, trends *Odds from William Hill; all times Central; ATS records from [TeamRankings.com](https://www.teamrankings.com/nba/trends/ats_trends/?sc=all_games)* ### Raptors at Hornets odds, 6 p.m. TOR: 56-23, 35-43-1 ATS, 25-14 road, 18-20-1 ATS road CHA: 36-42, 36-40-2 ATS, 24-15 home, 19-18-2 ATS home __Spread:__ Raptors -6 __Total:__ 224 __Moneyline:__ Raptors -230, Hornets +195 __Betting tip:__ Charlotte PF Marvin Williams will miss his second straight game with a foot injury. ### Hawks at Magic odds, 6 p.m. ATL: 29-50, 41-38 ATS, 12-27 road, 23-16 ATS road ORL: 39-40, 41-36-2 ATS, 24-16 home, 22-17-1 ATS home __Spread:__ Magic -9 __Total:__ 225.5 __Moneyline:__ Magic -400, Hawks +320 __Betting tip:__ Atlanta has won six of seven ATS and 16 of 21 since the All-Star break, while Orlando, which is a half-game ahead of Miami for the last playoff spot in the East, has won eight of 10 SU (7-3 ATS). ### Spurs at Wizards odds, 6 p.m. SA: 45-34, 41-37-1 ATS, 14-25 road, 17-21-1 ATS road WSH: 32-47, 38-41 ATS, 22-17 home, 23-16 ATS home __Spread:__ Spurs -7 __Total:__ 226 __Moneyline:__ Spurs -270, Wizards +230 __Betting tip:__ Washington forward Jeff Green (rest) will miss his fourth straight game. San Antonio guard Marco Belinelli is questionable with left hip soreness. __Bookmark us:__ [Daily NBA betting coverage](https://www.betchicago.com/nba-betting) ### Knicks at Rockets odds, 7 p.m. NYK: 15-63, 30-45-3 ATS (worst in league), 7-32 road, 16-22-1 ATS home HOU: 51-28, 38-38-3 ATS, 29-10 home, 21-16-2 ATS home __Spread:__ Rockets -17.5 __Total:__ 220 __Moneyline:__ Rockets -2400, Knicks +1200 __Betting tip:__ Houston has won four straight SU and ATS, and five of six, while New York has lost seven of eight SU and ATS. ### Heat at Timberwolves odds, 7 p.m. MIA: 38-40, 42-35-1 ATS, 20-18 road, 26-12 ATS home (best in league) MIN: 35-43, 37-41 ATS, 24-14 home, 20-18 ATS home __Spread:__ Heat -2.5 __Total:__ 218 __Moneyline:__ Heat -155, Timberwolves +135 __Betting tip:__ Miami, which is a half-game behind Orlando for the final playoff spot in the East, will be without guard Josh Richardson (groin) for at least the rest of the regular season. ### Pistons at Thunder odds, 7 p.m. DET: 39-39, 40-36-2 ATS, 14-25 road, 19-19-1 ATS road OKC: 45-33, 39-39 ATS, 25-14 home, 19-20 ATS home __Spread:__ Thunder -8.5 __Total:__ 215 __Moneyline:__ Thunder -405, Pistons +325 __Betting tip:__ Detroit forward Blake Griffin is questionable and may miss his fourth straight game with a sore knee. The Pistons are sixth in the East, but only a half-game ahead of Brooklyn and Orlando and one game up on Miami. ### Grizzlies at Mavericks odds, 7:30 p.m. MEM: 31-47, 36-41-1 ATS, 11-28 road, 15-23-1 ATS road DAL: 31-47, 43-34-1 ATS, 23-16 SU and ATS home __Spread:__ Mavericks -4.5 __Total:__ 214.5 __Moneyline:__ Mavs -190, Grizzlies +170 __Betting tip:__ Memphis has lost four of six SU and ATS, and PG Mike Conley is expected to miss his third straight game with an ankle injury. ### Kings at Jazz odds, 8 p.m. SAC: 39-40, 45-32-2 ATS, 15-24 road, 20-19 ATS road UTA: 48-30, 41-35-2 ATS, 27-12 home, 19-19-1 ATS home __Spread:__ Jazz -10 __Total:__ 224 __Moneyline:__ Jazz -550, Kings +425 __Betting tip:__ Utah PG Ricky Rubio will be a game-time decision after missing Wednesday's win over the Suns with a hamstring injury. The Jazz are 6-7 ATS on the second night of back-to-backs. ### Pelicans at Suns odds, 6 p.m. NO: 32-47, 36-42-1 ATS, 13-26 road, 19-19-1 ATS road PHX: 18-61, 35-44 ATS, 11-29 home, 17-23 ATS home __Spread:__ Pelicans -2.5 __Total:__ 230 __Moneyline:__ Pelicans -140, Suns +120 __Betting tip:__ Phoenix PG Devin Booker will miss the rest of the season with an ankle sprain. He was averaging 43 points in the five games prior to getting hurt in Wednesday's loss to the Jazz. ### Blazers at Nuggets odds, 9:30 p.m., ESPN POR: 50-28, 44-33-1 ATS, 20-19 road, 21-18 ATS road DEN: 52-26, 40-38 ATS, 32-7 home, 24-15 ATS home __Spread:__ Nuggets -6.5 __Total:__ 216 __Moneyline:__ Nuggets -260, Blazers +220 __Betting tip:__ Portland is two games behind Denver for the second spot in the West, and the teams play a home-and-home Friday and Sunday. The Nuggets are 2-0 this season against the Blazers (1-1 ATS). ### Cavs at Warriors odds, 9:30 p.m. CLE: 19-60, 37-41-1 ATS, 6-34 road (worst in league), 18-21-1 ATS road GS: 54-24, 34-43-1 ATS, 28-11 home, 16-23 ATS home __Spread:__ Warriors -16.5 __Total:__ 226 __Moneyline:__ Warriors -2400, Cavs +1200 __Betting tip:__ Cleveland PF Kevin Love is unlikely to play after missing the last four games with a shoulder injury. Golden State is 3-7-1 ATS on the second night of back-to-backs, while the Cavs are 8-5 ATS in that situation. ### Lakers at Clippers odds, 9:30 p.m. LAL: 35-44, 32-46-1 ATS, 14-26 road, 17-23 ATS road LAC: 47-32, 45-33-1 ATS, 25-14 home, 22-17 ATS home __Spread:__ Clippers -11 __Total:__ 230 __Moneyline:__ Clippers -700, Lakers +500 __Betting tip:__ Lakers forward Kyle Kuzma is questionable after missing the last three games with an ankle injury, as is Clippers PG Patrick Beverley, who missed Los Angeles' loss Wednesday to the Rockets. The Lakers are 6-6 ATS on the second night of back-to-backs. __PLAY:__ Our free [Daily NBA Pick 5 game](https://betchicago.chalkline.com/games/nba-pick-5). Pick five select NBA games ATS to win a BetChicago prize pack.